Good relationships are essential in business (as in most areas of life). Customers often rely on organizations for advice and guidance to help them effectively make purchase decisions and use products and services. Establishing and maintaining a positive relationship with customers is paramount to organizational success. Ethnoscapes Global can help you better understand your customers’ valuation of the information they receive from your organization and provide insights that will help you further deepen your relationship with them. Healthy and productive relationships between organizations and their employees are dynamic, sensitive, and essential. Not only do employees receive income from their employers, they also derive a significant part of their personal identity from this relationship. Although some employees may stay with an organization for decades, nothing in this relationship is static. Markets and businesses change, as do work environments and demands on employees. Understanding the work relationship from the perspective of the employee can help to inform key organizational structure and business decisions, as well as help to improve productivity and employee/employer relationships. 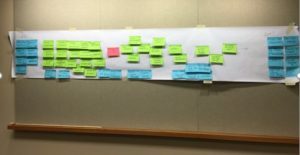 In the spring of 2016 Ethnoscapes Global organized four Journey Mapping sessions with consumers who had replaced a window(s)/door(s) within the last year, in order to identify ways of improving consumers’ window/door replacement experience. Read more, here.